Gruss Gott! Greetings from a cold but sunny and glorious Salzburg for Day Two of our Fox Blu-ray filming sessions. It has been crazy fun, running up and down this ancient city, and seeming to climb ev'ry mountain along the way. Steven Smith and his dream team from Trailer Park Productions are finding great new angles, and sensational interviews, to give the Fox Blu-ray of THE SOUND OF MUSIC an array of content, the likes of which even diehard SOUND OF MUSIC fans haven't seen before. We started the day at Mirabellplatz, right behind the beautiful Mirabelle Gardens. Twice each day, Panorama Tours sends out its popular ORIGINAL SOUND OF MUSIC TOUR, and we tagged along for part of the ride. We met fans from England, Scotland, Singapore, Malaysia, Brazil, Japan, Sweden and Americans. We got off the bus at its very first stop, at the incredibly beautiful lakeside palace called Schloss Leopoldskron. This stunning chateau never appears in the film, but its gorgeous lakeside grounds certainly do â€“ as the film von Trapps' "backyard." 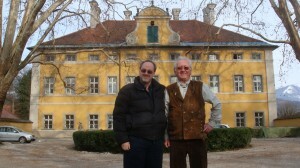 Here's Walter, our tour guide from Panorama tours, in traditional Austrian garb, standing with me in front of Schloss Frohnburg -- a beautiful Salzburg palace used as the front and back of the von Trapp villa. We spent the early afternoon at a very special place: Nonnberg Abbey. This 8th Century Benedictine Nunnery is the oldest in the German-speaking world; the real Maria was a novice here, and was married here. In 1964, the then Mother Abbess allowed Robert Wise to film several key scenes here. The current Mother Abbess spoke on camera about the amazing history of this thirteen-hundred year old nunnery, and of one especially famous novice who spent a few life-changing years here. 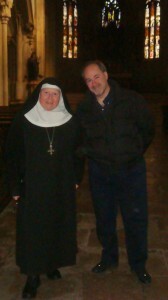 The Mother Abbess of Nonnberg Abbey and I are standing inside the thousand year old chapel of this ancient Nunnery, in the very place where the real Maria and Captain married in 1927. Like Georg Steinitz, Ute Herzog is another Salzburger with unique recollections of the adventures that went on during filming here. Frau Herzog served as publicity assistant to the film's (evidently) tireless PR man, Mike Kaplan more than 45 summers ago. We caught up with Frau Herzog at Frohnburg, the palace with a distinctive front and back (painted in the ubiquitous "Hapsburg yellow" of this region) that stood in for the facades of the von Trapp villa. 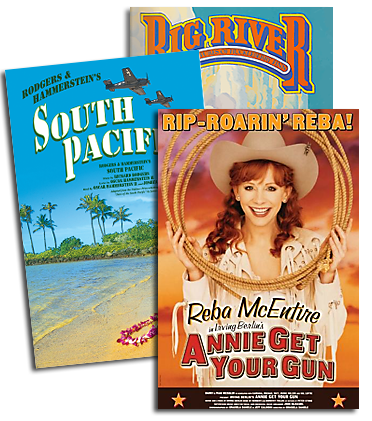 She had more great stories for us about the making of this musical movie classic, which evidently had as much press attention then as it still enjoys to this day! In the park of the fairy tale palace Hellbrunn we found SOUND OF MUSIC fans making pilgrimage to the gazebo built by Fox for the film, and left behind when the crew flew back to LA. These many years later, fans cluster around its famed glass doors and peer in, as if they might see Rolf and Liesl dancing together. And speaking of parks â€“ we made our way to the gorgeous Mirabelle Gardens in the heart of Salzburg. Here, Wise & Co. filmed the most iconic moments for "Do Re Mi" â€“ including the chase through the arbor, the posing between statues, and the finale atop the Gardens' steps. We had a chance to see the Mirabelle Gardens through the eyes a Fox camera once again. Our Fox team and I couldn't get anywhere around Salzburg without the invaluable help of our Austrian-Australian guide, Walter Gruber of Panorama Tours. Here's Walter, in traditional Austrian garb, standing with me in front of Schloss Frohnburg â€” a beautiful Salzburg palace used as the front and back of the von Trapp villa.